It took me a while to figure out what the theme for this year’s Halloween makeup looks would be. I’ve done a lot of cute looks and some scary ones, but I decided that this year I would just make full-on creepy makeup tutorials! 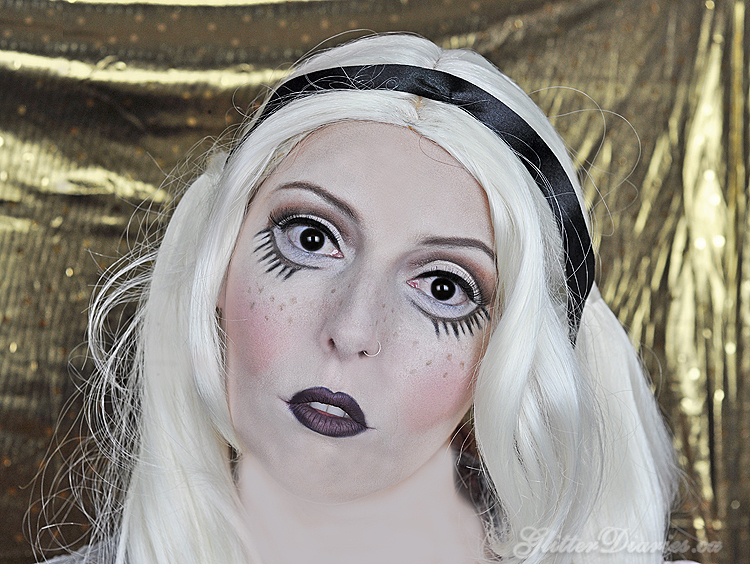 For my first post I present to you.. my Evil Doll Halloween Makeup Tutorial! This look kinda scared me when it was all said and done.. and that’s when you know you’re on the right track! Meet the doll, Madeleine. She may look sweet and innocent but don’t let her looks fool you! She has an appetite for murder (and yummy fingers!) and will stop at nothing to wreak havoc upon the household that owns her. Apply a white eyeshadow base to your lids and then top with an off white matte shadow and blend it partially into your brows. Use a brown cream shadow and create a rounded crease. Blend and buff out crease with a soft brown shadow. Using the crease liner as a guide, continue line below lower lid. Use a white liner above the line to create a doll-eye effect. Use black liquid liner to create lower lashes and line your upper lash line as well. Apply wispy lashes. Use a taupe brow liner and draw a thin line through your brows. Apply a white makeup base to your face. Add a bright pink cream blush to your cheeks, sculpt your cheeks with a light brown cream and then with the taupe brow liner, add some freckles. Finish face by setting it with loose powder. Line lips with a purple liner and then fill in with a dark eggplant lip colour. Disclosure: Products marked with ‘*’ were provided for review and makeup looks. 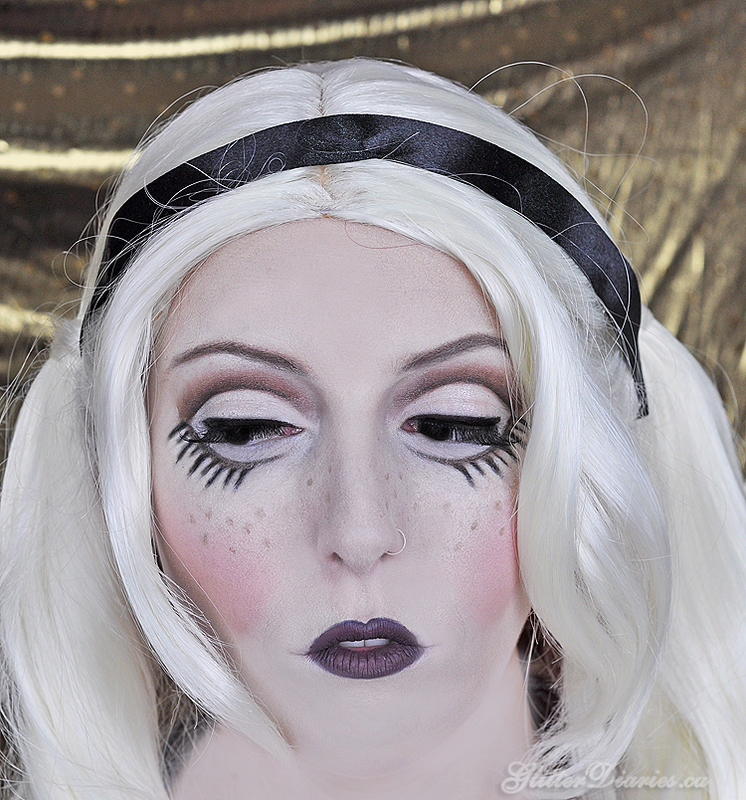 This is an excerpt from the article Evil Doll Halloween Makeup Tutorial which originally appeared on http://glitterdiaries.ca/.